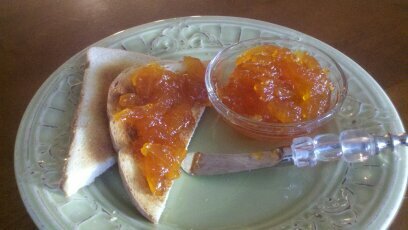 A breakfast of toast and grapefruit marmalade is so Greece in summertime. It’s sweet and just a bit bitter, so delicious. It’s a unique flavor and one I happen to love. This recipe uses only the grapefruit skin and not the fruit which you might think would produce a terribly bitter taste but a couple of quick steps will take care of that. The first step is to soak the rinds overnight – this is a must when you try this recipe, don’t skip it! The second step is my father’s secret ingredient and bitter banisher – salt. Just a pinch makes a huge difference in the final product. This traditional recipe is made with no added pectin. Pectin is the thickener that makes jellies gel and is naturally found in the white skin, or pith, between the fruit and the peel. Remember when you’re peeling the grapefruits, and don’t peel all the pith away. 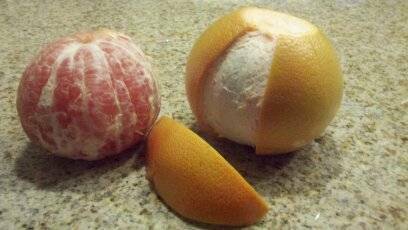 Peel grapefruits and slice the skins into very thin strips. 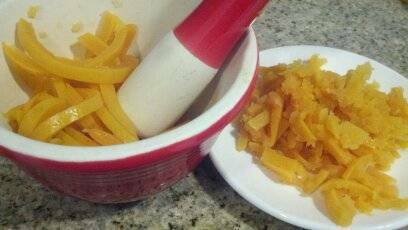 Place sliced rinds into a medium size (I use a 3 quart) saucepan with lid. Cover the rinds with cold water, add the tsp of salt and set on the stove or counter top to soak overnight. The next day, pour out the salted soaking water, rinse the rinds and cover again with water. 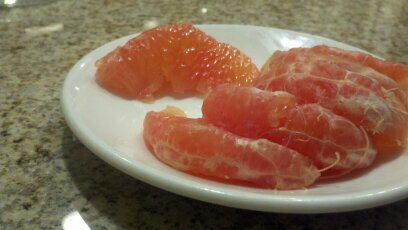 On a low simmer, cook grapefruit rinds for 2 1/2 to 3 hours until they are very soft. Turn off the heat and measure out the cooking liquid and rinds together. They should come out to between 4 and 5 cups combined. 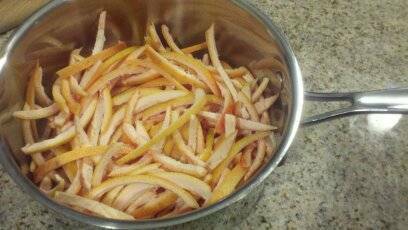 Strain the softened rinds out, set aside in a small bowl and pour the liquid back into the pot. Mash the cooked rinds gently in a mortar and pestle a cupful at a time. It will take a few seconds to get them started but keep going and they start to break up nicely. Once mashed, return rinds to the pot of liquid and bring mixture up to a boil. Add the sugar and boil rapidly for anywhere from 30-45 minutes, stirring frequently. Don’t stray too far from the stove during this time and be careful as hot syrup can leave a nasty burn. You’ll be looking for the liquid to lightly coat the back of a metal spoon. The liquid will cook down by more than half by the time it’s ready. The grapefruit pieces will be very soft and the liquid will be a light syrup. Stir in fresh lemon juice and cook for another 5 minutes. 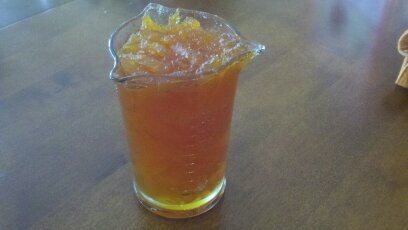 Allow marmalade to cool for at least an hour and then ladle into glass jars. This recipe yields a little over 2 cups cooked marmalade. The marmalade will be delicious for up to a month in the refrigerator and if your house is anything like mine, it’ll be gone well before then! Another great reason to make this recipe – sweet juicy already peeled grapefruit segments. This is a very Greek way to eat grapefruit and very different from our American tradition of scooping out the fruit with a spoon. Just thinking about them makes my mouth water.